New level reached... 44 Faces! he carving on the left is a design that was commissioned by a friend and done to his specifications. He wanted the number one billion with the word �cents� rendered in small faces, each a different characters per his supplied drawing. Well, this turned into a serious challenge. Once I laid out the design I discovered that I was going to have to carve seventy different people to make the form of the numbers and the seventieth character, the dot after the word cents. Postscript: On the right is my best multi-face silhouette carving to date. I really got to know this bunch of guys. I didn't set out to carve forty-four, that's just the number that came out of the contours of the host image. Forty-three are easy to discern, the twenty-eight faces emerging from the Indian and the fifteen from the buffalo, but there is a sixteenth face hidden in plain sight on the buffalo. These guys were really fun... especially the face of the buffalo. I have done demonstrations at seven shows from suburban Chicago to Milwaukee. Three recent Convention Demonstration carved nickels. s a long time coin collector, I have spent many wonderful Sundays at local coin shows perusing the wares of the various dealers who happen to be on hand. 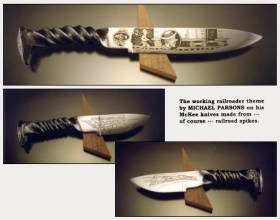 Occasionally I�ve wondered what it�s like to be behind the table selling, talking to other collectors, learning new things and educating others, but I never really pursued the idea� until January of 2005 when I was offered a free table at my club�s show if I did a Hobo Nickel carving demonstration. Well, what would you do? I packed up my equipment, printed some OHNS flyers, drafted my eight year old and headed off to the show. Although I didn�t sell too much at that first show, I was able to teach a large number of collectors about the field of hobo nickels, I learned a bit about hobos from people who knew them, and I was given free tables at two other shows, if I would put on my demonstration. Hmm, I think I�m on to something. ince that first show, I have done demonstrations at seven shows from suburban Chicago to Milwaukee (the cheddar corridor) and have had a great time. At each show I usually manage to carve a nickel to the point where I need to finish off the field. Since that isn�t much to watch, I do that part at home. While carving, I always seem to meet new and unique characters out of the collecting world. 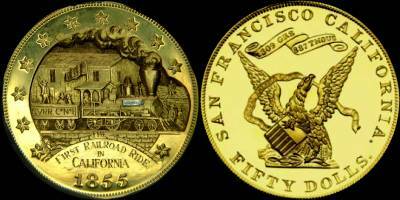 Some people will watch for a while and ask if I�m breaking the law by defacing coins, so I explain how hobo nickels are not fraudulent and therefore legal. Others are surprised when I tell them the prices hobo nickels go for, but I still get an occasional sale. Chet Krause said it looked interesting and gave me his business card. One fellow, who seemed to know that my show prices were a little low, bought one of my standard derby type carvings. Would you believe when I got home that night, it was already on Ebay? If I remember right, it sold for about double what he paid. At this last show, a young lady (I�m feeling old) asked if she could take my picture. It turns out she was covering the coin show for the local newspaper and needed something more than a picture of someone looking at a coin. When I heard the hammering and saw you hunched over a bowling ball, I just had to check it out, she said. Although she took a bunch of pictures, mine didn�t make it into the paper. So much for my fifteen minutes of fame. Show me the coins and Do Not spin me a yarn! We modern day Hoboes hitched a ride to our intended destination near Mission San Juan Capistrano. [We actually saw the Swallows returning!] The bulls we had to avoid were not as malevolent as Shack from Emperor of the North. We just had to watch our speed, wear our seatbelts and not bring fruit or vegetation into California. Our Dicer was a 17 foot moving truck. We left Anacortes, Washington heading for the wilds of the California, specifically the Long Beach Coin Show. We drove through the night and day, trading off at each gas up on this 1500 mile cross-country venture. Once our obligatory duties were completed, we headed straight for the jungle for rest and rejuvenation. With all due respect to Cookie's specialty... instead of Mulligan Stew around the campfire, we supped on Rosemary Chicken and carved Roast Beef accompanied by an array of fresh exotic fruits. Those folks at Heritage Auctions sure know how to welcome a couple o' weary coin Bo's. A few lots were won at this auction and they served to whet our numismatic appetite for the treasures to be unearthed on the Bourse. The next day our early Bourse excursions proved most successful. I scored an original Hobo by Bo; it was the Leprechaun and an early modern carving by Steve Campbell, signed and numbered #3. As delightful as this successful hunting proved to be, the most satisfying memory will be the look on a notorious dealer's face when I showed him these prizes and his realization that I had 'snagged' them before he hit the floor. All due thanks and gratitude go to my partner Bo, Zepp with his well-honed hunter-gatherer skills on the bourse. We were very pleased with our booty. Those originals and quality carvings are more scarce and tend to be traded within their own secret circle of specific dealers. Beware, one or two of these guys are modern day Yeggs!!! I do have one stick in my craw comment, it bugs me when a dealer tells me--- I just sold one. [or I have a whole collection, but it's not for sale right now.] Just tell me what you have NOW and is it for sale? Show me the coins and Do Not spin me a yarn! I have never been one for blowing my own trumpet. Although I've been engraving for 20+ years over here in the UK, nickel carving is a new canvas for me. I came across them on The Engravers Cafe forum and thought I'd give one a try... I'm hooked! I was warned that nickel carving is addictive, but it's too late for me. I don't think therapy will help either. Postscript: Ooooooh I hate being photographed, think I should have a shave? SCARY!!!!! I could have looked a bit happier, I was smiling, but with all the fur round my mouth, hard to tell. I thought I should include the microscope, as I'm permanently glued to it. Called in on my friend, guess what, he had a spare scanner waiting for me. Below you can see my first four carved nickels using a scanner. Here are the rules for the 2007 Penny Carving contest. Have fun! 1. 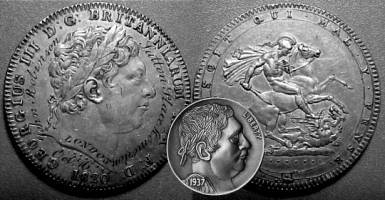 All engraving entries must be on a US penny or similar copper colored coin from your country that does not exceed 2cm. Only international entrants that can not get a US penny may enter an alternate coin. 2. All engravers may only enter 1 penny. 3. No Caf� baristas, bus people or wait staff may enter the contest. 4. Entries must be submitted by: 12pm (Noon) Eastern Standard Time (East Coast US) Friday, April 13, 2007.
a. It is the responsibility of the entrant to submit clear photographs of the penny to the Caf�. b. No photos will be re-touched or edited by the caf� with the exception of adding the engraver�s name to the photo. Please add your name to your photo if you�re able to. c. No photos can be accepted past the deadline entry date which will be posted in the Caf� � Noon on April 13, 2007. 6. The penny contest will have the following categories: Beginner, Intermediate, Advanced, and Professional. Each engraver should use his best judgment as to which category best suits him. All entrants may enter a maximum of 1 category. 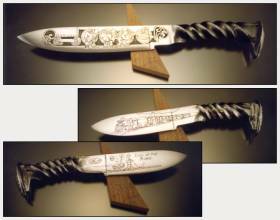 a. Beginner � this would be for people with beginning engraving skills who are just learning the basics. b. 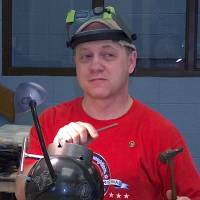 Intermediate � this category would be for non-professionals and hobbyists who have quite a bit of engraving experience, but do not earn a living engraving. c. Advanced � for people quite proficient in engraving technique, hobbyists, part-time engravers, coin cutters. d. Professional � for full-time professional engravers and advanced coin cutters. a. Penny entries will be posted at the caf� for a period of 7 days during which time the members may vote on the pennies. Votes will be conducted by a poll. Member�s votes will not be publicly viewable. Voting will start after the entry deadline on April 13th and will end at 12pm (Noon) Eastern Standard Time (East Coast US) on Friday, April 20, 2007.
b. Each member will only be allowed to vote 1 time per category. This is controlled by the forum software. c. Winners will be notified when polls close by a posting on the caf�. d. All winners will receive a certificate for their category. 8. This contest is for the fun of engraving. It is the Caf�s hope that it will foster good will and further the skills of the entire community by the high level of mentorship and discussion that has been exhibited. HH, HK and HL) and iron-chromium alloy steels (HA, HC and HD). The first group has greater high-temperature strength and ductility. Naturally I had to call him immediately to express my gratitude and how impressed I was with the quality of the leather work. Mike told me that when he was a young man, and couldn't work when it rained, he went to a local blacksmith who was also a harness maker. There he learned how to do leather work the right way! As each generation leaves us more and more of these skills disappear... with fewer and fewer younger folks interested in putting in the hard work to keep these crafts alive. Too often, any day they can't work they are likely to spend watching television and playing video games... such is life! In a year of upping the ante, we hit a stellar milestone when the YV 330 observation car hauled paying customers for the first time since 1945. This was part of the Niles Canyon Railway's Triple Steam Fest celebration. The 330 was invited to participate as the last car on the passenger train starting the event. As such, we had an early departure time of 7:30AM, and an earlier arrival at the yard to ready the 330 for the maiden run. This afforded the opportunity to take the attached picture shortly before the 330 departed to make history. The pale violet light made for nearly perfect photographic conditions. The rear deck is certainly looking better with marker lamps lit, the solarium glowing, and the stunning new drumhead. Artwork for the drumhead was developed from a black and white photo of an original YV drumhead. 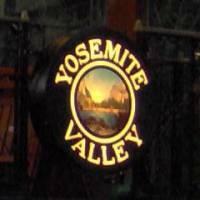 Jack Burgess discovered that the center was actually a photo of "Valley View", a popular sightseeing spot near the exit of Yosemite National Park. He managed to edit an existing color picture taken at the spot, and produce a hand tinted color effect that really provides an authentic look. In the view, El Capitan is to the left, the Merced River flows past a lush green meadow in the foreground, and Bridalveil Falls frame the picture to the right. Just looking at that makes me want to visit Yosemite right now. We were shoved down the canyon by Robert Dollar #3, Quincy #2 (both 2-6-2T steam locomotives,) and Granite Rock #10 (an 0-6-0T that closely resembles the Quincy.) Both the down and up trips were breathtaking, so much so that it seemed to go by with the click of your fingers. The canyon was swarming with hundreds of photographers, admittedly most were there for the beautifully restored steam power, but our car did rate a photo line at the depot. ALL STEAM WEEKEND CELEBRATION: Three tank engines will be under steam on Saturday, March 17, to celebrate the return to service of 80-year old Robert Dollar No. 3, a 1927 Alco 2-6-2T that hasn't been under steam in nearly 50 years. Now an oil-burner, No. 3 holds the honor of being the last wood-burning rod engine to be built in America. She will be joined by Quincy RR 2-6-2T No. 2, and a special visitor to the Niles Canyon Ry. for this weekend only, Granite Rock No. 10, a 1942 Porter 0-6-0T, courtesy of CSRM at Sacramento. This one-time event also celebrates the 20th anniversary of the Niles Canyon Railway, the operating railway museum established by the members of the Pacific Locomotive Association. Two trains are planned for 3/17 - a morning passenger departing Niles at 8:30 am, and an afternoon mixed from Niles at 12:30 pm. Each 4-hour session will include runbys and some switching of cars and engines. 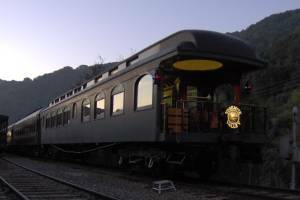 The morning train may include the first run of Yosemite Valley Railway parlor-observation car No. 330 since its retirement on the YV in 1946. Tickets are $49 for either the a.m. or p.m. train, or $75 for both. Any Saturday ticket includes a late-afternoon walking tour of Brightside Yard, and an evening photo op. Space is limited. Tickets should be purchased in advance at 925-944-5883. See ncry.org for details. While Saturday is planned for the railfan, Sunday is more of a family day. The three engines (Woody, Quincy and Rocky) will be used on all Sunday trains with several departures from both Niles and Sunol. Fare is $15, or $7.50 child (3-12) for the approx. 1 hour 15 minute roundtrip. While this event is not expected to break-even, if there is a profit it will go to additional NCRy restoration projects, of which there are many! Click on any video to go to an order page at RailwayShop. Click on any book to go to an order page at Barnes & Noble. Small pine needle bear sitting raffle for a super good cause! The drawing is August 25th, 2007. Tickets are $1.00 for one; six for $5.00; and twelve for $10.00. Folks... it is not the price of the tickets, whether you win or not, but the volunteer firemen who we forget about until a big fire or something such as September 11, 2001 the attack on America by terriost at the World Trade Center. Firemen came from all over the United States to volunteer their service. This is only one small way we can say thank you is to support a volunteer fire department in Idaho who needs help. The date Oct. 16 is engraved above the date. CarolLee CeeBo Allen, OHNS LM#35, recently purchased this wonderfully engraved 1820 GEORGIUS III crown via eBay. What a wonderful acquisition! 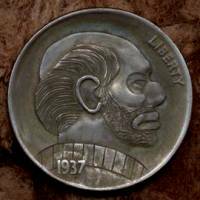 I was immediately reminded of the George III carved nickel that Bill Jameson created for me. Then I discovered that CeeBo had paid considerably less for her treasure than I'd paid for mine. You said you had some nickels. I assume you meant Hobo Nickels. I have made a bunch. Most of them for Bikers. Think what you will but Bikers are not all bad. Lots of them I call friend. I stuck a nickel in the ball vise and scratched you one. It probably isn't the best one you got but you can't beat the price. My maternal grandfather was Roy McKee. He kept me alive when I was a kid. My Dad was hard on me and Pop was always there when I needed him. Thus I sign my work McKee. The only double-sided Andris Smilga carving thus far. This was recently said in a public forum about yours truly which has brought the age old question; What really is a Hobo Nickel and what isn't? back to the table for considered contemplation. The short answer is; No one person or group can realistically defend taking it upon themselves to define for the genre what is and what isn't a Hobo Nickel! That terminology will always mean different things to different folks. This will remain true forever despite all altruistic or self-serving attempts to the contrary... plain and simple! Carve What You Know Best! 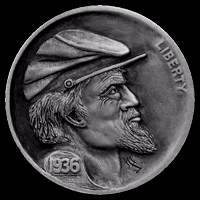 September 2005 excerpt: There isn't any ONE set of rules for the creation of carved hobo� nickels. The pieces that bring the highest prices are invariably high effort pieces on high-grade/condition Buffalo Nickel host coins. Steve Adams has been known to spend 5-7 full days carving a single nickel and he is arguably the premier nickel carver in the US. He is a die engraver with long years of experience so when he puts time on a carving it isn�t wasted motion but is really productive effort. Generally Hobo themes sell the best… this includes anything related to railroads of course since hobos are strongly associated with the railroad system. Neither hobos nor railroads are exclusively a US subject obviously. Both have existed in Europe, Russia, South America, India, China, Australia and other places… all it takes is a railroad and someone who wants to get a ride without paying. Themes outside the area of hobos and railroads CAN be quite valuable depending on the level of expertise/art evident in the carving. I have a four piece set of carvings with an Eskimo, a walrus, two walrus, and a scrimshaw sperm whale tooth carving. All Alaskan subjects and distinctly not hobo related… see Four Real People Carvings from Steve Ellsworth . The same artist is going to do a series of Native American portraits from the SouthWestern US… again not hobo related. These pieces likely will sell for just a little bit less than a hobo theme piece would but perhaps not… it all depends on how the pieces strike the collectors. Like all art… these pieces appeal to some folks and not to others. Carvings on coins other than Buffalo Nickels are interesting to some people but that collector group would be much smaller and thus the prices the pieces would sell for would most likely be considerably less. Even though Andris� first pieces are not particularly interesting, as far as subjects go, I know he can come up with pieces from his own unique perspective. Like they tell authors… Write what you know best. I'd tell him to carve what he knows best. 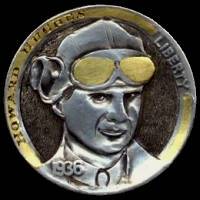 I�ve never seen his artwork but I recall you saying something about awards, medals, and such. He could easily incorporate devices from those designs with distinctly Russian/European hobo/railroad subjects to make some really unique carvings. The inclusion of exceptionally small semi-precious stones and metal inlays can dramatically increase the appeal of a carved nickel and thus the price it sells for. Lee Griffiths has put just the smallest pin points of gold into the eyes of a couple of his carvings which gives a glitter to the eyes that is dramatic for such a nominal effort and virtually no investment in that small a quantity of gold, see WinoSanta . I recall one piece where he put a bit more gold in the eyes and it really came out superb… see CowardlyLion . For more extensive gold work you can see the glasses he put on me… see V-Dubya and the chains he put on a sleeping hobo… see Workers . Trying to think like a Hobo. I figure they carved more than Nickels. Since Hoboes did a lot of walking I believe a nice walking stick is in order. If I was a Hobo of the day I would make a stick something like this one. Through my travels I would see Hobo signs and I would carve them in my stick to remind me where I've been and to warn or help others I meet in my travels. This would help me in teaching others and telling stories while riding the rails. It would be kind of a hobo diary with a new story for every sign. Of course I don't have a story for each of the eighty some signs on here, but I would if I had made and carried this stick though my entire hobo life. This stick measures 45.5 inches high... or three inches under four feet. Carved from a Pine Branch from the mountains of Idaho. It's light and strong and has a very comfortable feel to it. I've posted three pictures in the HOBO SHOP ALBUM . Click to enlarge the picture and there will be a description and price under it. Don't be afraid to offer me less for it. All I can do is say no. Then again, making a living as a folk artist I might just say it's yours. If I should say no the first go around, then ask me again in a week or two. I might just need the money then. Then again the other alternative would be to offer me more for it. LOL. That would be GREAT!! It's true....I'm not a hobo. At heart I am and being a Folk Artist I believe we have common ground. I believe in living a simple life, although simple does not always mean easy. If I can't find work I create it. I always respect Nature and clean camp sites. I have a two mile stretch of Highway I also pick up every year. I decide my own life and nobody rules me. These are a few things we have in common from the Hobos Code of Conduct. Have any of you been wondering about my Pine Needle Bear? When I moved to Idaho I just couldn't take the city life anymore. I move here to take care of my Dad, who past away a year later. I didn't want to leave Idaho and the only jobs were in town twenty-two miles away. Nothing over $5 an hour. I met April and she asked me if I could do anything for a living what would I do? I said I wanted to be an Artist. She said, Okay, you're an Artist... get to work. So I did. With a single Dremil and some old cracked deer antlers I began carving. We would buy used jewelry at yard sales and thrift stores and take them apart, using the parts for our own antler jewelry. When we had a small rack of earrings done we would hit the Jungle. Beating the streets selling what we could. Collecting materials here in the mountains we started other art projects. Walking sticks, canes, driftwood sculptures with carved antler. Everyday a new challenge of bartering and wondering what to make next and if we could sell it. Always wondering where our next nickel would come from. One day April says to me to make a bear. She says, Bears always sell good. I, of course, did not want to make a bear. I told her everyone makes bears. I want to make something nobody has ever made before. She says, ...but I love bears and gave me that LOOK. I took a deep breath and said OOOkay, ...but if I make one it will be like no other bear you've ever seen. Oh boy, now I had committed myself to something I wasn't even sure of. Day after day I figured I needed a medium to work with that no one else has ever used for a bear. I'd pick up a rock and say a Rock Bear? NAW, Plaster? Naw, Bottle caps? Naw. On and on for weeks I kept picking things up. Some great ideas came but remember I had no budget to work with. ZERO, nada. Like the Hobo I only had what God would give me to work with. I was finally at my wits end trying to think of the perfect material to use. Something that wouldn't cost me more than a few dollars investment. Frustrated, I went out to work in the yard. Pine cones everywhere! I stared picking them up and said, you guess it, A PINE CONE BEAR! My mind raced to figure out the possibilities and I came up with the same old NAW. I then bent down and picked up a small handful of long pine needles and said, BEAR HAIR! About that time I look up and across the street to my neighbor�s yard and saw a roll of chicken wire. The wheels started turning!!!! This might just work. I then asked for the wire and took it to my shop where I began cutting, bending, shaping, wiring the shape of a bear cub. With the look of a Teddy Bear. April didn't know what I was up to. I brought the bear frame into the house and showed her. Immediately she sighed, Awwwwww, how precious. I said, Wait til you see what I'm going to do with it. I went to the back room and grabbed a sheet, brought it out in the living room and spread it out across the floor. A puzzled look on April's face. I went outside where I had raked up a pile of pine needles, bagged them up, brought them in a dumped them on the sheet. I said, Come on April, give me a hand sort these needles and she said, NO WAY, You're on your own with this one! I insisted, and said it won't take very long. She still refused saying NO WAY! So I proceeded to sort needles and weave them into my bear. Thinking to myself, this will be Great. It will only take me a week or so. My Giant pile of pine needles didn't amount to much. At least two thirds of the needles I had to throw away. Back for more. It wasn't going as fast as I thought it would. Maybe it will take me a few weeks. Three months later I finally finished him. Buster Bear named after our friends son who had just died from MS. A winter of trying to keep the needles out of the carpet. Don't walk around barefoot in your house when you work with pine needles. I had carved his nose from wood and his claws and eyes from antler. Before I tried the Big Bear, I did another small cub standing. It went a little quicker than my first bear� knowing what not to do now. First of all I wanted to say thank you for taking an interest in my work. I have been a coin collector for about five years now and I always saw the hobo nickels when I would get on eBay, but never really took too much interest in them. What caught my eye was a nickel that Ralph J. Perrico from Ohio carved. This was just about a month ago, so I am still really new to everything. I talked to him about how he carved his and he said he used push gravers so I bought some but just got them in the mail a couple of days ago. I haven't tried to use them yet. I have been using a Dremel with burs. I have made about fifteen hobo nickels so far; they usually take me a couple of hours to make. I also got some tips from Robert Covert about how to make them look old and where to buy burs from. I am going to have to stop doing it in a couple of weeks for three months because I am deploying. I plan on making at least fifteen more before then and I will continue once I get back. are often misunderstood or unappreciated. 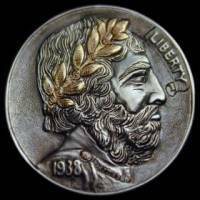 HOBO NICKELS are very much in vogue with today�s numismatic collectors, and the prices realized for these unique pieces would make any former hobo, or Bo, cry. In spite of their popularity, the history behind the issues is not always understood or appreciated. 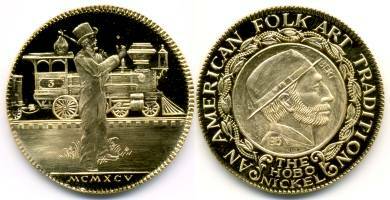 While attending the recent ANA convention in Denver, I overheard a young collector say that hobo nickels were the handiwork of a bunch of bums too lazy to work! He implied that the train tramps preferred riding freights over seeking gainful employment. My response to this young man�s statement was to conduct some research on the subject of hobos and the nickels named after them. 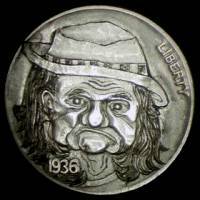 One resource was The Original Hobo Nickel Society (OHNS), which specializes in these sidebar collectibles. To begin, we must turn the hands of time back nearly three-quarters of a century to the year 1932, during the Great Depression. Records show nearly 17 million men were unemployed, and an estimated 34 million men, women and children were without any means of support. Our welfare system as we know it today had not yet been created. Those fortunate to have found full-time employment, which often included working Saturdays and Sundays, usually earned an average of $16.21 per week. Still, many people could not afford their mortgage payments, and some 273,000 families found themselves evicted from their homes and living on the streets as banks foreclosed on their properties. 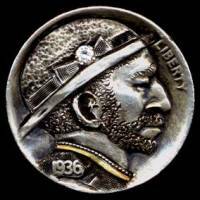 obverse or reverse of many hobo nickels. Many of the millions of American men who lacked any visible means of support took to the road in search of work. These days we call them hobos, often in a derogatory tone. A half million of these men, ranging in age from their mid-teens to 21, moved from town to town by foot, thumb and rail. Their ranks included college students who no longer could afford tuition, and farmers evicted from their land because they could not pay rent. Very few voluntarily chose the hobo lifestyle. Some of these men turned to artistically engraving unique portraits on Indian Head 5-cent pieces, which they traded for meals at roadside diners. Many Bos were World War I veterans who had been promised bonus certificates under the Adjusted Service Certificate Law. The compensation was based on their war service: $1 for every day they served in the military, and a 25-cent premium for every day served overseas. Congress munificently passed this legislation in 1932 in the midst of the Great Depression, but, as our elected representatives are prone to do, added a stipulation: no payments were to be made until 1945! Penniless veterans essentially were being asked to go without eating for another 13 years! Although some tried to rectify this absurdity, Congress balked. Veterans from all over the country headed�often by freight train�for the nation�s capital, where they planned to march. The press dubbed the group the Bonus Expeditionary Force (BEF). Though not all the protesters were true hobos, some did fund their meager existence by using a chisel and graver to enhance the purchasing power of their few nickels. 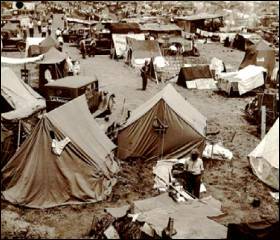 By the time the Bonus Army reached Washington, D.C., its number had swelled to more than 20,000 men. Setting up camp along the Anacostia Flats outside Washington, they scrounged the city�s dumps for scrap metal and timber to erect temporary shelters. One imaginative marcher turned a casket into his residence! The BEF maintained order in the camp by enforcing bans on drinking, carousing and boisterous behavior. Congress� response to the Bonus Marchers was to adjourn, and Congressional members went home to comfortable houses, beach cottages and yachts to prepare for their reelection campaigns. Federal troops then moved in and dispersed the Bonus Marchers. At least two veterans, both of whom served in the dangerous trenches in France during World War I, died in the ensuing confrontation. To his credit, President Herbert Hoover ordered the Army to cease and desist from further pursuit. General Douglas MacArthur, however, ordered the Army to pursue the Bonus Marchers and to burn and destroy the Hooverville they had built. The defeated veterans headed back to their homes, many of which were shantytowns. Some Bos engraved their few remaining nickels to exchange for meals on their return. Prior to the sale of Gallery Mint, Inc. to Striker Token and Medal I had reached an agreement with Ron Landis for a project with the goal of striking museum grade gold medals from a group of his historic non−COPY medal dies. Since none of these dies had ever been struck in gold this project met Ron's long standing policies of not restriking previous issues and not striking anything down metal. I consider this medal set a tribute to my 24K friend Ron Landis and his 24K talent! Do you want to learn about hobo history and hoboes of today? This Group will be to educate anyone interested about hoboes - the depression hoboes; hobo music/musicians; hobo tramp art and crafts; hobo nickels; campfire ceremonies; hobo organizations past and present; hobo events held today; hobo museum and cemetery in Britt, IA. Speak out and ask the questions you always wanted to know. If you have the answer let us hear it. 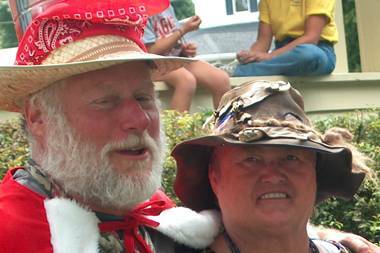 This Group is for anyone who wants to learn about hoboes. 11. Decide your own life, don't let another person run or rule you. 12. When in town, always respect the local law and officials, and try to be a gentleman at all times. 13. Don't take advantage of someone who is in a vulnerable situation, locals or other hobos. 14. Always try to find work, even if temporary, and always seek out jobs nobody wants. By doing so you not only help a business along, but insure employment should you return to that town again. 15. When no employment is available, make your own work by using your added talents at crafts. 16. Do not allow yourself to become a stupid drunk and set a bad example for locals treatment of other hobos. 17. When jungling in town, respect handouts, do not wear them out, another hobo will be coming along who will need them as bad, if not worse than you. 18. Always respect nature, do not leave garbage where you are jungling. 19. If in a community jungle, always pitch in and help. 12. Do not cause problems in a train yard, Another hobo will be coming along who will need passage thru that yard. 13. Do not allow other hobos to molest children, expose to authorities all molesters, they are the worst garbage to infest any society. 16. If present at a hobo court and you have testimony, give it, whether for or against the accused, your voice counts! James LaBonte responded to the needs of others, even when he was in pain from chronic health conditions. He and a couple other men, after he left ComEd, did roofing jobs on widows' homes, and did other repair jobs, said his wife, Wanda LaBonte. For 10 years, the Franklin Grove man drove fellow vets to the Veterans Association hospital in Iowa City, Iowa. He'd had a liver transplant 13 years ago, so he usually had an appointment out there himself, Wanda said. James LaBonte died Tuesday (January 30, 2007) at his home in Franklin Grove, at the age of 66, from complications of a liver infection. Born in Chicago, LaBonte served in the Marine Corps in the 1960s, but was unable to fight in the Vietnam War. He didn't leave the United States. He got very ill with rheumatic fever, and that caused him to have an enlarged heart, which gave him disability for the VA, Wanda LaBonte said. James worked for ComEd as a maintenance man for 26 years, retiring in 1993. He joined a variety of organizations in Lee County, such as the Dixon Optimist Club, Moose Lodge 727 in Dixon, and the Lee County Coin Club. He would collect old coins, and liked to grade them and look at them. He became quite a good grader, Wanda said. Joe Venier, owner of Venier's Jewelry Store in Dixon, said James was a very likable person. We used to refer people to him, Venier said. LaBonte also was known for his sense of humor. Wanda said her husband kept his co-workers in stitches, and teased waitresses all the time. They'd say, 'How was the food.' He'd say, 'Except for the taste ...' He'd say the water was too wet and the salt was too salty, Wanda said. Art DelFavero put a lot of blood, sweat and tears (not to mention imagination and talent) into carving this nickel and he wanted you folks to know that it is translucent so he sent in the backlit photo (shown here on the right) for us all to enjoy! 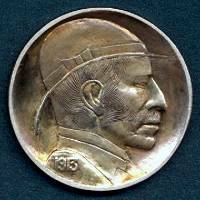 Recently I attended a local coin show in Livonia, Michigan, a Detroit suburb. As I walked the bourse floor, I asked each dealer if he or she had any hobo nickels. The answer was usually No, or I haven't seen one in four or five years. I did find a total of three modern, below average carved nickels. One dealer told me he bought one just so he could show his customers what a hobo nickel is. I had just about traversed the entire bourse when I came across an unusual Buffalo nickel at one dealer's table. It was a beautiful AU 1915 Buffalo Nickel with the numbers 5, 1 and an anchor etched into both the obverse and reverse (see photos). It looked like this had been done with a hand stamp or stamps. I was sure it had been done a long time ago, and probably in 1915, because of the AU condition of the nickel. The dealer knew nothing. He had picked it up with some other coins and exonumia from an estate. I made an offer and drove home with my stamped 1915 nickel. I really didn't know what I had and why the nickel had been stamped in this manner. So I began doing a little research on the Internet. I did find out that there was a U.S.Navy Destroyer O�Brien (DD-51) that was commissioned in 1915. At DANFS Online: The Dictionary of American Naval Fighting Ships I found the following: The second O'Brien (DD-51) was laid down 8 September 1913 by William Cramp and Sons, Philadelphia, Launched 20 July 1914; sponsored by Miss Marcia Bradbury Campbell, great-great granddaughter of Gideon O'Brien, and commissioned 22 May 1915, Lt. Comdr. 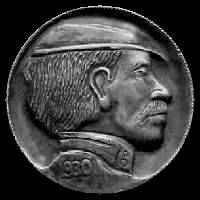 C. E. Courtney in command. So I thought that my nickel might be some sort of commemorative of the commissioning ceremony? But this was only an educated guess. A couple of days later, I went back to the Internet again. In an article called Customs of the Navy, written by Lieutenant Commander A.D. Taylor, C.D., R.C.N. in 1956 and revised in 1961. Commander Taylor said, In the Sixth Book of the Roman poet Virgil we learn that the old seamen used to place a coin under the heel of each mast to pay the fare to Charon for crossing the River Styx, thereby ensuring a safe passage for all hands over �the river of the underworld� should disaster overtake the vessel. In deference to this old superstition the practice is still carried out. A copper coin inserted in the mouth of a dead seaman in Roman times served the same purpose in respect to the individual. This told me coins were used by sailors but still did not answer my question why the nickel was stamped in the manner of my find. Then I really hit pay dirt. I found out that there was an extensive process of pre-commissioning and commissioning a new ship. One part of the pre-commissioning process is called Stepping the Mast. Stepping the Mast: The placement of the mast into the hull in ancient times signified the moment when a shell truly became a ship. To commemorate that moment, the Romans placed coins under mast for good luck or to help deceased Sailors into the afterworld. Today, coins, often reflecting the ship's hull numbers, are typically placed under or near the mast for good luck in a small ceremony. 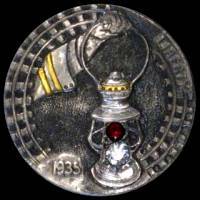 So my nickel was a coin used in the manner above for a shipboard ceremony in 1915 on the USS O�Brien. How many of these were there? Are their more out there, or is my coin the sole survivor? 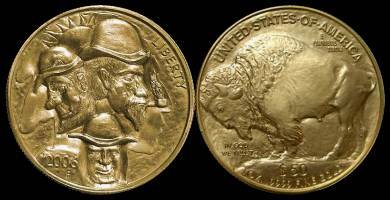 I just know it's a beautiful Buffalo nickel and great collectible. Which of these Images Were Deemed Acceptable by the Moderator of The_Hobo _Nickel_Group? I tried to add these carving scans to a photo album on The_Hobo_Nickel_Group so new folks could see carvings done by a broad group of currently active carvers. So which of these photos would you expect that I was allowed to add? Ah... that was too easy ...you guessed! Nary a single one passed muster! Thank you for asking about this group, the purpose of this group is teo fold. 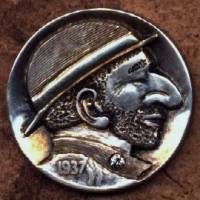 It is to introduce people that have never heard of this art form in connection with the history of hobo nickels. Hobo Nickels over the past five years has taken some serious turns with the hign end engraved coins. These coins are great examples of the engraving arts but they don't represent what hobo nickels were really all about. 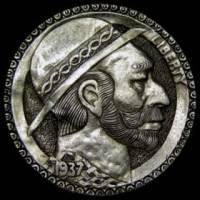 In this group we want to take people back to a good portion of the simple art of hobo nickels which has gotten lost with the interest from seasoned collectors for art coins. 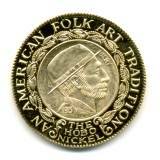 There really is a problem when all carved coins are being called hobo nickels when in actuality they aren't. With the people in this group they want to learn about hobo nickels, many have heard about them but many of the people aren't coin collectors and so this is something totally new to them. Think of this as kindergarten, this is the beginning to bridge the gaps of many hobbies to introduce them to a new folk art. I'm not here to fight the OHNS or battle with the carvers about them putting up their high grade carvings, they don't have a place in this group. All the hign end pictures, all the carvers putting up 20 and 30 pictures of nickels that bridge the variety of carving styles will only confuse these people at this point. The goal of this group is to take them back to the simple art and explain how the hobos played a big part in the history that is being lost. This is a way of preserving where this all came from. There is so much information out there about hobo nickels but it doesn't tell anyone what they really are. All the information says is...the hobos traded them for a sandwich and that's about it. 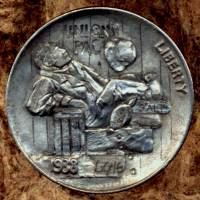 There is so much more to hobo nickels and I think what happened yesterday with the pictures from you and Steve Cox, it was a prime example of what has happened to hobo nickels. They have gotten bowled over and pushed out of the way for the highly refined engraved coins which has little to do with what hobo nickels are. Nobody is trying to stop what you say on the club page, but little is said about the true folk art and this group is focused on that. Once these people learn about this art they will not be happy staying in a kindergarten class and will move on with a better understanding of where they came from. They will see the masterpiece carvings in good time, but hopefully because of the information they learn in this group they will never forget the roots of where it came from. September 27-October 1 * Riverhead, Long Island, N.Y.
and goat horn and occasional in ivory. Shown above is a picture of my workshop showcasing one of my latest endeavor's. I personally gathered, washed and wove pine needles to make this life size bear. It�s a quest for adventure for some, while for others it�s the feeling of being alone with just the stars � but most hoboes will agree they choose their lifestyle for the freedom it brings them. Although some history books may say the hobo culture died out after the Civil War, MamaJo, the hobo queen of 2003, will be the first to tell you this culture is still alive and thriving. Meet some of today�s hoboes who continue to keep their community vibrant and continually growing through the illegal lifestyle they lead by riding America�s rails, or freight-train hopping as the railroad police may know it as. Copyright � 2007 The Columbia Chronicle. All rights reserved. Hobo Nickels? What are they? Who made them? How are they made? If you've asked yourself these questions but never got the answers you've come to the right place. 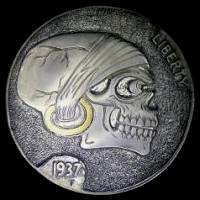 The Hobo Nickel Group is an open forum to learn, buy, sell, collect, ask questions and meet others interested in the art of coin carving. 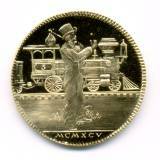 Welcome, my name is Mike Pezak and I am a coin carver and I am the moderator of this group. I'm very excited about having a place where people can come for information and to share their ideas and talk and learn about coin carving and hobo nickels. 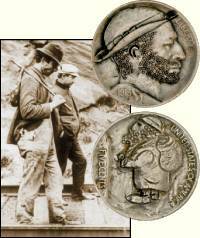 The group is open to any person interested in learning about hobo nickels, you don't have to be a collector, you just have to enjoy hobo nickels. 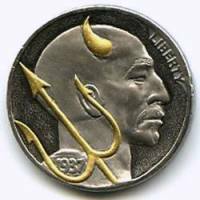 I hope you will feel welcomed to share anything of interest in the world of hobo nickels and coin carving or ask questions. We have photo albums if you have any pictures of nickels you would like to share with the group, please set one up. Most of all we're not stuffy here so sit back and relax and lets all learn together. If you have hobo nickels to sell or would like to buy, let the group know and maybe someone will have what you are looking for. We are new and I'm sure we will start slow but with everyones help we can all have a good time and learn about this wonderful folk art. Illinois Rail-Splitter ~ What you are seeing here are the results of Bill's modifications of Abe until he finally got an aspect that he was satisfied with. Bill said; "Not sure if this is close enough." and "Way too many hours in this one." If it had been me doing the carving I would have been 'pickled tink' with the first effort. �Ala�ad-Din and TheDjinn ~ �Ala�ad-Din (Aladdin) is one of the tales with an Arabic Syrian origin in The Book of One Thousand and One Nights, and one of the most famous. Evil Ifrit in this book are called "the seed of Iblis". The Spirit of the Lamp in the story of Aladdin was such a jinni, bound to an oil lamp. I was unable to find an individual name for The Djinn in this story. Nathaniel and Bartimaeus ~ The magician John Mandrake (birthname as Nathaniel) is from a fantasy series by Jonathan Stroud. Bartimaeus, is a five-thousand year old djinni, a spirit of approximately mid-level power. There are five basic levels of spirits, in order of increasing power: imps, foliots, djinni, afrits and marids. Odysseus and Thelxiepeia ~ Odysseus was known as 'Ulysses' in Latin mythology and is often portrayed wearing this distinctive soft hat. Circe warned Odysseus of the dangers of "Sirens"... singing creatures who pulled men to their death. She advised him to avoid hearing the song but that if he really felt he had to hear then he should be tied to the mast. His men should have their ears stopped with wax and be ordered not to heed his screams. In Greek mythology the Sirens were Naiads (sea nymphs). Their number is variously reported as between two and five, and their individual names as Thelxiepia/Thelxiope/Thelxinoe, Molpe, Aglaophonos/Aglaope, Pisinoe/Peisino�, Parthenope, Ligeia, Leucosia, Raidne, and Teles. Carving and the creative process is really no different in whatever medium the artist is working in. There is a big difference between an artist and a technician, an artist can also be a good technician but a good technician is not always a good artist. Carving nickels is just something I was very natural at doing and I've found that the worst mistake that I can make is thinking or over thinking the carving. I do best when I'm just playing. When I play I don't have any set pattern in mind, however, Museum grade carvings are just the opposite. They are very demanding and time consuming. The process actually takes carving the pattern then recarving the pattern with more refind detail under a 10 to 15X power microscope and then the last step which usually requires about 4 to 5 hours under 30X power to clean up the carving. It will take 2 to 3 days of carving for one coin but the results are worth it in the end. I think the most difficult time in carving is starting from scratch, learning the tools and how to use them with even a small degree of precision will deter most people. I had about 400 hours of engraving practice under my belt, I also had a fairly good knowledge of the tools. I tell people that it is fairly simple to carve a nickel and in my mind it was, I also have been a jeweler for 30 years. So working with small work is something I was very comfortable doing but even with my experience as a jeweler I didn't have the skills as an engraver. I am not an engraver by any means, I don't do standard type engraving to this day. I have changed and altered my skills to do my carving in a style that combines so many techniques, some of which I've created to get a look that I want for my work. I prefer to make coins that look like they have been hand carved. At first glance, by engraving standards, my coins have a crude appearance. It's only when you look at some of my carvings that small details keep popping out, nails in the bottom of shoes, stitching in seams, fabric texture on hats and clothes ect ect that really aren't obviously visable in photos are one trademark of my work, plus warm scenes that people relate to is important with my high grade carvings. Other coins I do are just fun carvings and then I also do other carvings with various degrees of all carving levels. I would say that if you wanted to try carving a nickel, go for it. It's only a nickel and if you screw it up beyond recognition, throw it out and start on another one. It will all come together, it may not be a masterpiece but that's ok as long as you have fun making it, and while you are carving it you can think of some hobo sitting by a camp fire with a nickel and pocket knife making a nickel so that he has something he can trade for his next meal. That gives you a much better respect for this art form and also what hobos use to go through just to make it from day to day.